Sometimes you need to do some pixel color processing selectively in some areas of your CG image. Usually this can be done in two dimensions, or more generally, through lighting. Indeed, while effects studios doing live action and photoreal rendering treat lighting as a way achieve realism and believability, animation studios see lighting as a way to paint colors in the screen in a way that lets them realize their artistic vision. Point-lights, rods, and volumes become brushes really. However, many of these light-based coloring techniques lack thickness or a sense of participating media - they only affect surfaces but not the space between them. In this article we'll see how to develop one volumetric tool that you can use to implement such colorization techniques, or to implement simple traditional fog, but localized in space. The idea is that we want to place a sphere in some location in space and accumulate some participating media density along the view ray within the volume. Then use that accumulation to drive some visual effect (as simple as fog or as complex as image distortion, color grading, texturing or some procedural effect. But it all starts from accumulating density of media along a segment or space. 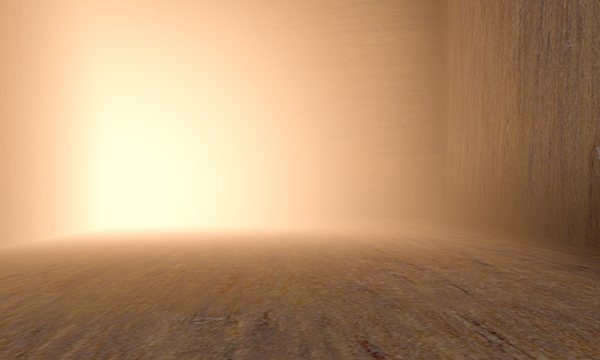 Which can be easily implemented with volumetric raymarching. However this is slow. In this article we are going to see how to achieve this analytically without raymarching, by using only a few maths operations. We used this technique in the VR film "Henry", and I know it was used as well in Epic's game "Robo Recall". For points in space x, a sphere with center sc and radius sr is defined by , and a ray originating at the camera position ro and going through our pixel in direction rd can be defined as with t>0 for rays shooting forward and for an isotropic metric. The overlap and intersection of the pixel ray with the sphere can be solved by replacing x in the sphere equation with the ray equation: . Since , squaring both sides of the equation and expanding the result gives us , which is a quadratic in t with solution with and as long as of course. We can now integrate the fog along the segment. We can choose from a variety of fog density functions. We chose one that peaks at the center of the sphere where the density is maximum (1.0) and decays quadratically until it reaches zero at the surface of the sphere.